One of the biggest and most delayed construction projects in Los Angeles is nearing the finish line, and the developer is casting a wide net. Woodridge Capital Partners filed for approvals to market the twin condominium buildings at its Century Plaza Hotel redevelopment project to prospective buyers in New York, The Real Deal has learned. The filings, published by the Real Estate Finance Bureau, are mandated by law, and filed with the New York state Attorney General. Woodridge has been redeveloping the Century City site, which is a $2.5 billion project. 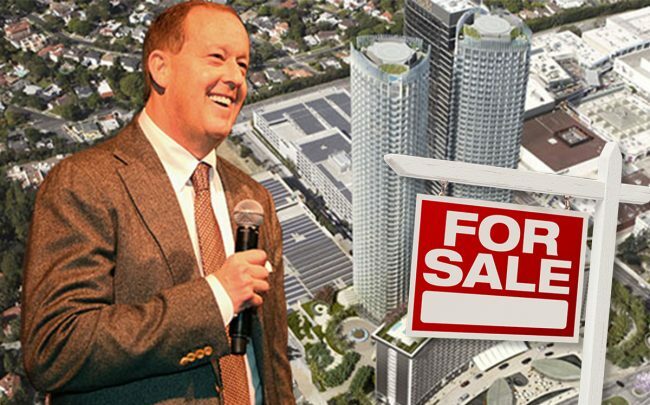 Now, the firm is trying to lure buyers to its 143-unit North Tower and 125-unit South Tower, records show. Both towers, designed by Pei Cobb Freed, are part of the larger redevelopment plan at the Century Plaza Hotel at 2025 Avenue of the Stars. The 394-room hotel, operated by Fairmont Hotel & Resorts, is also scheduled to open later this year, delayed from a 2018 opening. Once completed, the massive project will add 100,000 square feet of retail and restaurant uses to the area. Amenities include multiple swimming pools, a spa, game room and private walkway to the recently renovated Westfield Century City mall. Rising 46 stories each, the condo towers will have six, 11,000-square-foot penthouses with private rooftop access. Each penthouse will list for more than $50 million, according to The Hollywood Reporter. Last year, Michael Rosenfeld, Woodridge CEO, told THR the firm has already collected $50 million in reservations. Since the project gained city approvals in 2013, it’s been beset by delays. Construction was pushed back a few months, starting in late 2016, just as Woodridge locked down $1 billion in construction financing from J.P. Morgan Chase, Colony Capital, and in EB-5 investments. Last March, the firm secured a permit, valued at nearly $90 million, to wrap up construction on the South Tower.